CNG cylinder inspection labels are applied to CNG cylinders to demonstrate the “Pass” or “Fail” result of a detailed CNG cylinder inspection. These inspections are required by the National Highway Transportation Safety Administration’s (NHTSA) FMVSS 304 which states that a detailed visual inspection of all CNG cylinders must be conducted by qualified CNG fuel system inspectors every three years or 36,000 miles (whichever comes first) and after any fire or accident. 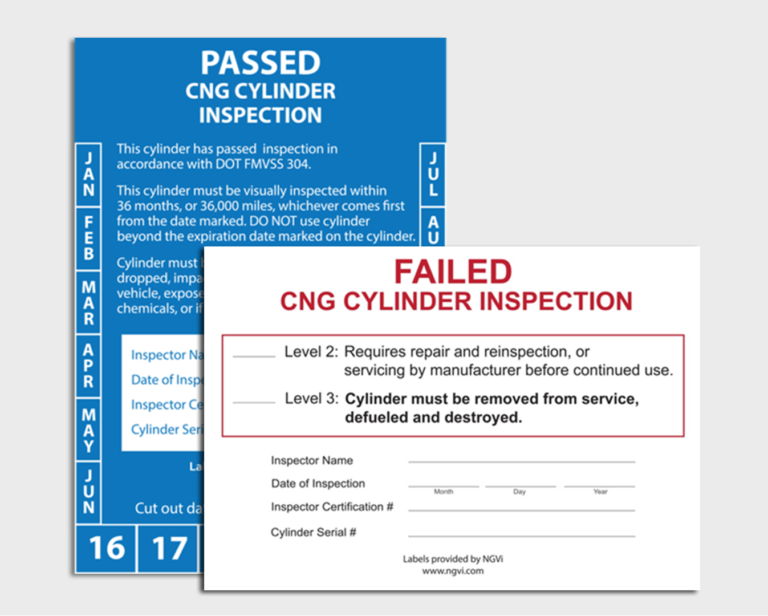 You may order CNG Cylinder Inspection labels directly from our website for $2.50 per label. Labels are sold in packs of 20. If you have questions about NGVi’s CNG Cylinder Inspection labels, please click here.